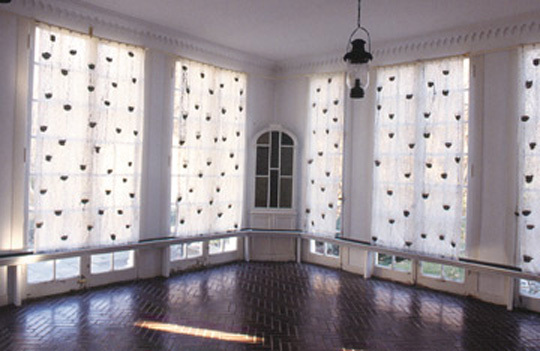 Three walls of windows covered with lace curtains hung from CPVC pipes overlooking an herb garden. 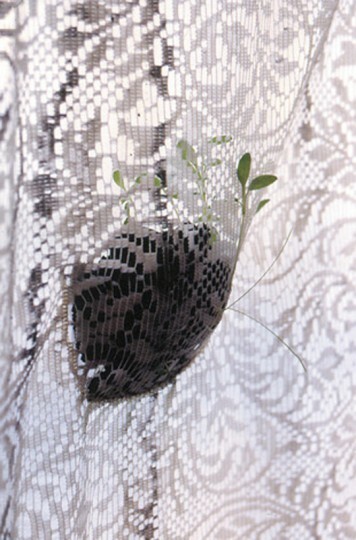 7 curtains sewn together with pockets in which 7 different culinary herbs were planted, and watered by a drip irrigation system. The water dripped down the curtains to rain gutters that recycled the water back to a stainless steel reservoir. Two existing corner cabinets were stuffed with dried culinary herbs. The scent of culinary herbs was prevalent with sound of running water.